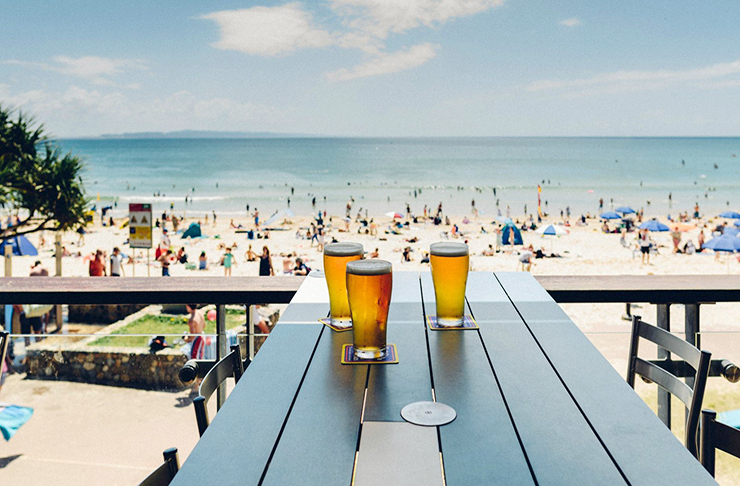 If you want the best views on the Sunshine Coast to go alongside your finger-licking seafood platter and icy cold beer, then it’s pretty much a given that you’re going to pull up a chair at your local surf club. Right? Possibly the most iconic members of the Sunshine Coast community, the humble surf club is loved by one and all. As well as being general do-gooders and housing the people who save thousands of lives every season (side note: lifesavers, you rock! ), surf clubs are THE spot to nab a feed that won’t send your bank balance into the red. So, next time you’ve got out of town family or friends visiting, or just want to sink a coldie to an ocean backdrop, call on our pick of the Sunshine Coast surf clubs with the best views. Ahhh Noosa! The land of the golden points. The lush Noosa National Park. And easily one of the Sunshine Coast surf clubs with the best views. Visit Noosa Surf Club on any day of the week and you’ll come face to face with a heady mix of locals, out-of-towners, and tourists from further afield. Dishing up ocean views that normally come with a fine-dining price tag, this cruisy, beachfront establishment has a sprawling deck, perfect for escaping the midday heat. Just don’t forget to look up from your giant plate of crumbed calamari every once in a while to enjoy the scene! Perched over family-friendly Kings Beach in Caloundra, the Caloundra Surf Club aka Mets on Kings, showcases the beach and the public swimming pool through its huge floor-to-ceiling glass windows. Visit at night, and you can play spot the ship, as the glistening lights graze the horizon. Dust off your sandy feet and carry your hungry belly from your towel to The Surf Club. What’s on the menu? Delicious pub grub at its finest—think: ham and cauliflower croquettes, paella, or rock up on a Sunday morning (between 7am and 10am) for the all-you-can-eat brekkie buffet. Who knew taking in the ridiculously stunning views of Mooloolaba Beach could be this tasty!? Modest, yes. Lacking views? Hell no! From Maroochy Surf Club‘s beachfront position, you’ll be able to cast your eyes all the way down to Point Cartwright. Not bad, eh? 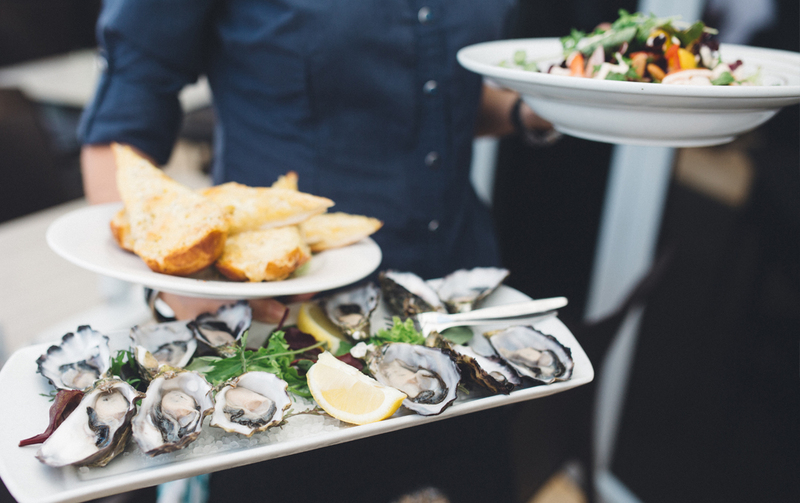 Tip: If you’re stopping in for a bite to eat, book a table or you’ll end up scrambling over families hunting down the best spot to look out to sea while chowing down on bistro-style food. Sitting proud in the middle of the Coast, Alex Surf Club is a stone’s throw away from the busiest beach on the Coast. So, along with taking in the picture-perfect views that stretch from Mooloolaba to Mount Coolum, you’ll also get in some serious people-watching time. Which, let’s face it, is super fun. Especially over a crisp glass of sav! If ever there were an under-the-radar contender for Sunshine Coast Surf Clubs with the best views, we reckon it’d be Marcoola. This little guy is super understated, and yet has one of the most enviable locations on the Coast, with an open-air deck hovering just a few metres above Marcoola Beach. Whilst it may not have the all-encompassing views of Alex Surf Club or Coolum, this relaxed haunt delivers some epic meal specials that can be enjoyed to a soundtrack of crashing waves. Views in Coolum don’t come ANY better than what the surf club serves up, so make sure you nab a seat on the massive deck! As the only restaurant and bar on the beach side of David Low Way, Coolum Beach Surf Club rules the beach. On top of the vistas, Coolum is the ONLY club in all of Australia to feature a wood-fired chargrill. So if you’re looking at combining the looking with a bit of chewing, you can’t go past a steak. Mmm-mmm! If you want the views without the hype of Noosa and couldn’t imagine anything worse than hunting for a park near Hastings Street on a Saturday, then Sunshine Beach Surf Club could be your go-to. With an awesome deck dotted with tables and large umbrellas, you can take in the stunning ocean views while throwing back breakfast, lunch, or dinner. Note: If a weekend breakfast at a surf club seems a little weird, it’s not! The pancakes are killer! Now you've had lunch, what about checking out the 50 Awesome (& Cheap) Things To Do On The Sunshine Coast. What about checking out Everywhere You Can Learn To Surf On The Coast. Image Credit: Swirltography, Hayley Williamson, Ellen Lynch and Noosa Surf Club.